Jackie Robinson believed in a God who sides with the oppressed and who calls us to see one another as sisters and brothers. This faith was a powerful but quiet engine that drove and sustained him as he shattered racial barriers on and beyond the baseball diamond. Jackie Robinson: A Spiritual Biography explores the faith that, Robinson said, carried him through the torment and abuse he suffered for integrating the major leagues and drove him to get involved in the civil rights movement. Marked by sacrifice and service, inclusiveness and hope, RobinsonÆs faith shaped not only his character but also baseball and America itself. 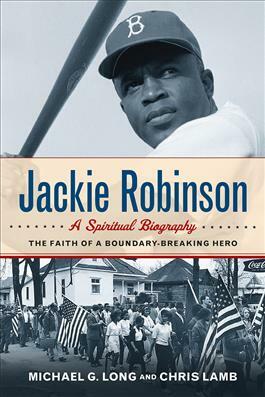 "Mining a wide variety of sources, Jackie Robinson: A Spiritual Biography provides a captivating portrayal of the way in which the Christian faith-rooted in Robinson's mother's Methodist tradition, nurtured by a young Methodist pastor named Karl Downs (who appears frequently in this book) and refined by his partnership with his wife Rachel-impacted his breaking of the color barrier. Later, the author's portray how Robinson's post-baseball civil rights work and engagement in business and politics was influenced by his beliefs. In addition to telling Robinson's own story through the lens of the Christian faith, the book is also an exceptional overview of issues of race and justice in America from the inception of the Civil Rights era through Robinson's death in 1972. Long and Lamb show a significant depth of understanding not only Robinson and his faith, but also broader concerns of race, class, privilege and American religious and political history." "As much a look back at Robinson's skill on the field, this also focuses on his life off the field, long after his career in baseball was finished. Long and Lamb are well-qualified authors who have written before about Robinson, as well as civil rights and spirituality. This is a good pick for baseball fans; homeschooled students seeking well-researched, faith-based materials; and those interested in civil rights and the role of Christianity in sports." "In this fast-paced read, Long and Lamb paint a portrait of groundbreaking baseball player Jackie Robinson that is both refreshing and exciting."